Something that is supposed to be a guaranteed success. Could be getting lucky on a first date. Or a business venture. Or an idea. The idiom originated in America and dates back to the 1800’s, probably in reference to gold. How many people risked it all for the sure thing only to discover that the cinch or the lock or the shoo-in or the slam dunk was forever elusive? Fifty percent of businesses fail in the first year. And yet, year in and year out billions of Buddha likenesses are sold worldwide. What makes Buddha such a sure thing? 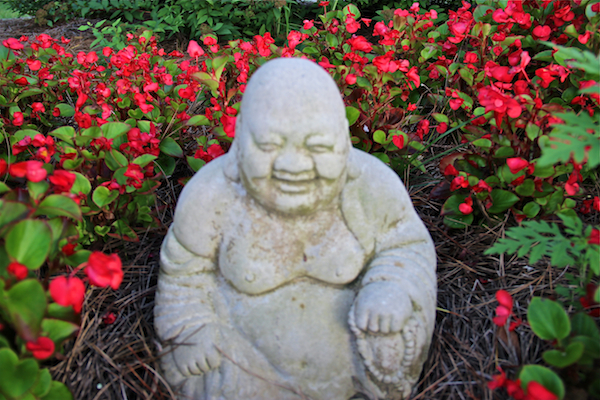 Would Buddha sell as much if the image wasn’t smiling? Leonard Cohen’s song, Hallelujah, was initially a flop and now it’s considered a masterpiece. Cohen wrote 80 verses of the song before he pared it down to its current version, including one at the Royalton Hotel in NY where he sat in his underwear banging his head against the floor. I wonder, how many bangs did it take before Leonard realized he was looking at a sure thing?